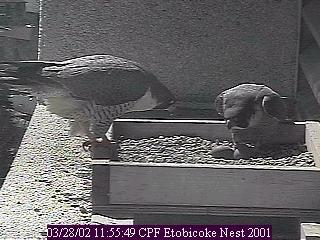 March 28th, 2002 -- Angel leaves no doubt as to who is in charge at this nest! Marco meekly backs away from the nest as Angel takes over incubation duties. The size difference between the two birds is nicely illustrated in this photo too.